Constructivism - in quotes. Constructivism was an artistic and architectural art movement, which rejected the idea of autonomous art, in favour of art as a practice for social purposes. This movement originated in Russia beginning in 1919, and had great effect on modern art movements of the 20th century, influencing major trends such as the German Bauhaus and the Dutch De Stijl art movement. Art must not be concentrated in dead shrines called museums. It must be spread everywhere – on the streets, in the trams, factories, workshops, and in the workers' homes. We [= Lissitzky himself] have named PROUN [the art style, stepping over from painting to architecture] a station on the path to the construction of the new form.. .From being a simple depicter the artist becomes a creator (builder) of forms for a new world — the world of objectivity. This does not mean the creation of a rivalry with the engineer. Art has not yet crossed paths with science.. .PROUN is understood as the creative construction of form (based on the mastery of space) assisted by economic construction of the applied material. The goal of PROUN is progressive movement on the way to concrete creation, and not the substantiation, explanation, or promotion of life. Everyone is equal before the machine.. ..everyone can be the machine's master or its slave. 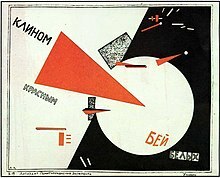 Quote of El Lissitzky, in 'Suprematism in World Reconstruction', Lazar M. Lisitsky, 1920; (despite its title, this text acted as a retrospective commentary on Malevich's original formulation of Suprematism and postpones a far wider concept, which Lissitzky later would call the 'constructive' method. * Cubism demonstrated in its constructions its modernity in relation to scale, but in painting and contre-relief we have in front of us an absolute scale which is this - forms in their natural size in the ratio 1 : 1. If however we wish to transform the contre-relief into an architectural structure and therefore enlarge it by one hundred times, then the scale ceases to be absolute and becomes relative in the ratio of 1 : 100 Then we get the American statue of liberty in whose head there is room for four men and from whose hand the light streams out. The Cubists were perhaps the first school to overcome this association of the ugly and the mechanical: they not merely held that beauty could be produced through the machine: they even pointed to the fact that it had been produced. ...They extracted from the organic environment just those elements that could be stated in abstract geometrical symbols: they transposed and readjusted the contents of vision as freely as the inventor readjusted organic functions: they even created on canvas or in metal mechanical equivalents of organic objects... This whole process of rational experiment in abstract mechanical forms was pushed further by the Constructivists.. .They created in form the semblance of the mathematical equations and physical formulae that had produced our new environment... seeking in this new sculpture to observe the physical laws of equipose or to evolve dynamic equivalents for the solid sculpture of the past by rotating a part of the object through space. Quote by Lewis Mumford, Technics and Civilization (1934) Ch. 7 "Assimilation of the Machine"
[Constructivism is] not as a tool or even a specific method, but rather as a perfect union of the coming state and the movement's 'spiritual' aims. Quote by Naum Gabo (1937) Circle: International Survey of Constructive Art. p. 116 - as cited in: Melinda Baldwin (2012) "A review of Scientific Moderns, by Boris Jardine" in dissertationreviews.org. From the very beginning of the Constructivist Movement it was clear to me that a constructed sculpture, by its very method and technique brings sculpture very near to architecture.. .My works of this time up to 1924.. ..are all in the search for an image which would fuse the sculptural element with the architectural element in one unit. I consider this Column the culmination of that search. But the projects with which the architects of Russian proletarian architecture present us are not only based on pure imagination, but their construction would, if they were fitted for realization, entail enormous waste of space and materials. The dwelling complex 'Wolkenbügel' [designed by Lissitzky, with the help of [ w:Emil Roth - Swiss architect, 1924] (assuming that one could live here without either freezing or melting! ), shaped like a 4, stands in a very un-constructive way on three legs in which the elevators are located. The latter take up as much space as would one or more skyscrapers. And these 'architects' are to teach the West what architecture is! The Constructivists' reality is that of the (natural) sciences built up from experience. Even if this reality has been shaped by man, it is no less objective and no less measurable than the reality of concrete natural objects.. .We practically have it in our power, like the machinist has power over his machine. The Constructivists were drawn into this [mechanical] movement especially because of their respect for machines and technical constructions. They saw in this a support for their ambition to find clarity and exactitude as opposed to subjectivity and individualism.. .Like New Objectivity, Constructivism is an attempt to liberate us from the subjectivity of our Expressionistic excesses. Constructivism blossomed in this New Russia; the Bolshevik Revolution undoubtedly contributed to the development of the still unfulfilled Constructivism. But the Constructivist also wants to control the art painting materials. He started by defining the general basic elements of the art of painting.. .For him painting was in the first place, an objective study, a willful transition of the strictest simplification of art painting tools/materials, until, eventually nothing was left except the famous black square plane by Malevich [who started later Suprematism ]. From there the art of painting was rebuilt. However, not to our subjective needs of expression, but to the most primitive possibilities that could be concluded from the black square plane, the so-called Constructivist elements.. .The Constructivist elements are for instance; two black planes next to and adjoining one another (a horizontal extension of the black square), a black square right above and adjoining another (a vertical extension of the black square), etc. After this, the circle, the triangle etc. There was a great deal to be learnt from the engineer. Firstly his accuracy, not with a grand gesture, but rather working with accurate calculations. This is what the Constructivist was searching for: objective, strict reality. Only.. ..in art there is no way to calculate. At best they could only play at being 'engineer'. Although the machine was a beacon showing the way from the shadows of Expressionism.. .Constructivism had to be freed from the machine itself. It had to find its own constructions, its own materials and specifically its own statics and dynamics. One can suggest movement by showing how we see something moving. For instance a fast turning wheel, where we no longer see the separate spokes. However, when the Constructivists want to express movement, they do this directly through the art painting materials themselves. They suggest movement especially through the form and direction of the figures used.. .Also for other sensations they try, as a test, a direct art painting expression, for instance the sensation created by a sound dying away, or an electrical current or a magnetic attraction. Lissitsky does exclaim 'Schafft Gegenstande' [Make Objects / Things]. But by this he does not mean real things.. .why 'Gegenstande [Things]'? He only wants to make pseudo-things which express his urge for reality, for the earth. Things of the same hardness, immovability, earthbound in the same way as the daily life he sees around him. The Constructivists do not limit themselves exclusively to painting materials such as paint and chalk etc., but use all possible materials if they are suitable for accurate use, such as metal, glass, concrete etc.. .Above all these were much more suited to the creation of things even more realistic than reality itself. Not all Constructivists concentrate so strongly on reality. There are those for whom inner life plays an important part, such as the non-Russian Moholy Nagy, Kassak, Baumeister etc. Their art painting figures often have a more symbolic meaning.. .Sometimes without any direct connection to reality.. .Moholy Nagy's work is 'l'art pour l'art' - as opposed to Lissitsky who is demonstrative; he is ethical in as much as he propagates the Bolshevist morale of not dreaming but doing, of preferring a direct gesture rather than one of beauty.. .Lissitsky wants nothing to do with 'l'art pour l'art'. 'Proun' – as he called his work – is art in order to demonstrate the feel of reality. In 'Kunstismen' [art magazine published by Lissitsky and Jean Arp ], Lissitsky defines Proun as the 'Umsteige-station von Malerei nach Architectur' (the 'Step-over from the art of painting to Architecture'). We know only what we do, what we make, what we construct ; and all that we make, all that we construct, are realities. I call them images, not in Plato's sense (namely that they are only reflections of reality), but I hold that these images are the reality itself and that there is no reality beyond this reality except when in our creative process we change the images: then we have created new realities. The moral attitude of Neo-Plasticism [= De Stijl] is very much like that of Constructivism, except that the Constructivists wanted to bring things out in the open and the Neo-Plasticists didn't want anything left over. Quote by Willem de Kooning (1951), in his speech 'What Abstract Art means to me' on the symposium 'What is Abstract At' - at the Museum of Modern Art, New York, 5 February, 1951, n.p. Mondrian.. .The Constructivists?.. .They had certainties. They wanted a stable basis to work on, but I'm afraid that that was enormous arrogance on their part. Nothing is stable and no certainties are possible. This page was last edited on 12 April 2018, at 14:39.